For the 2018 AP exams, the College Board (CB) piloted an early AP exam ordering deadline with a little over 100 schools. Students were required to register by Nov 1 in order to avoid a $40.00/exam late fee. Students who canceled an exam after the Nov 1 deadline were assessed a $40.00/exam cancellation fee. 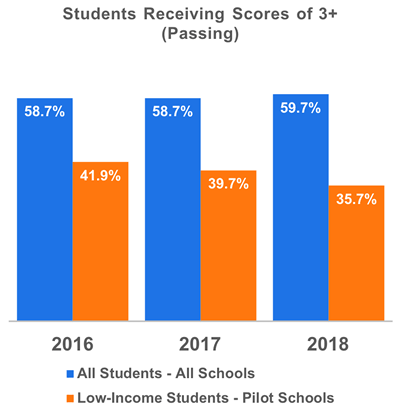 According to the CB data there was a 33% increase in the number low-income students taking the exam but only a 20% increase in the number of low-income students receiving a score of 3+ (a score of 3, 4 or 5 may earn students college credit or placement in a higher level course). CB data indicates that there were 3141 additional low income test takers at the pilot schools but only 742 additional scores of 3+. This gives a pass rate (scores of 3+) of 23.6% for the "additional" low-income test takers. Another way to look at this is that 76.4% of the low-income students who were coerced to take the exams because of the new deadline, late fees cancellation fees did not pass (scored a 1 or 2). Clearly an early commitment to the exam does NOT cause students to ". . . earn a score on the AP Exam that qualifies for college credit and/or placement" as the college board claims. CB Data shows that the fall ordering deadline effects low-income students significantly more than non-low-income students as there was a 33% increase in low-income test takers, but only a 4% increase in the number of non-low-income test takers. View a more in depth analysis of the data here. Learn more about the concerns over the changes here. Concerned About the Changes? Take Action!